Regardless of discipline, level of expertise, training philosophy, body shape, or fitness level, all riders do better in horse-related activities on the ground and in the saddle when they take care of their bodies and maintain their fitness. While riding is a great way to enjoy an active lifestyle, on its own it is not enough to condition and tone the body to the degree we need, and then the horse must make up the fitness gap in our physical partnership. If our reflexes are slow, if our bodies fatigue, if our position collapses, if tension patterns appear, then the horse suffers repetitive asymmetrical strain or develops compensatory movement habits. It is for the horse’s good, as well as ours, that certified personal trainer and riding coach Heather Sansom has developed an utterly achievable 9-week plan to give every rider the straightness, suppleness, strength, and stamina they need to ride their best. 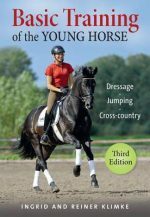 With hundreds of one-of-a-kind illustrations depicting accurate musculature on the rider s body, and dozens of proven exercises organised in a progressive fitness program with easy-to-use schedule charts, Sansom s book is the key to enjoying the ride, being fair to your horse, and getting into fabulous shape in nine weeks! The condition of a rider’s body is inextricably linked to the well-being and general condition of the horse. In order to achieve ultimate harmony between horse and rider, Heather Sansom has created an attainable 9 week plan to give all riders the straightness, suppleness, strength and stamina they need to not only ride well but to feel good while doing it. Sansom illustrates dozens of unique and effective exercises in a progressive fitness programme complete with colour illustrations and easy to follow schedule charts. Fit to Ride in 9 Weeks offers the key to achieving a healthy level of fitness that ensures both rider and horse well-being and optimal performance. Canadian National Equestrian Federation Certified Personal Trainer and Equestrian Coach, Heather Sansom, founded her riding fitness and coaching business Equifitt.com in 2007. As a Level 1 Centered Riding Instructor, she has helped riders of all disciplines, from around the world, amateur to professional, attain a level and type of fitness that improves their abilities in the saddle while enabling their horses to perform their best. She has published over 300 articles on rider fitness in equestrian magazines and spoken in numerous international forums.